Police in New York have reportedly made dozens of arrests and have been using pepper spray and batons as they try to stop anti-Wall Street activists from storming barricades blocking them off from the Stock Exchange. The demonstrations began peacefully, but turned violent as the night went on. The video footage shows police officers brutally swatting protesters with batons and spaying them with mace. According to some reports a local news reporter was hit and his cameramen was pepper sprayed. 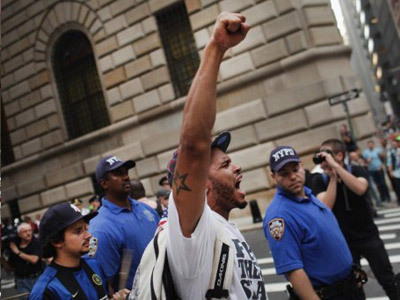 Dozens arrests were made, but NYPD has not yet given the final tally. Meanwhile in downtown Seattle, police have arrested around 20 demonstrators who refused to remove their tents from Westlake Park, the Associated Press reports. Last Saturday, nearly 700 protesters were arrested in a brutal showdown on New York’s landmark Brooklyn Bridge. 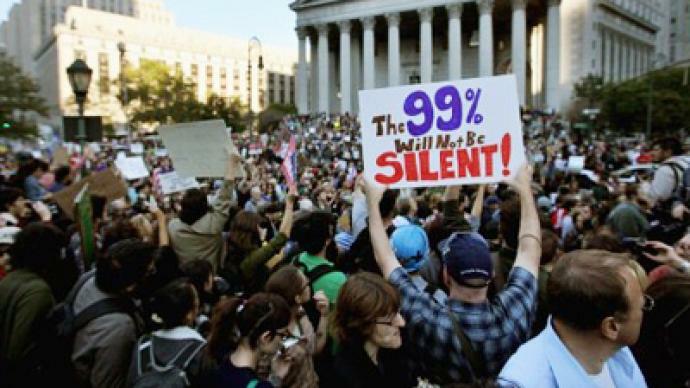 The “Occupy Wall Street” movement is growing as activists join forces with students and unions. 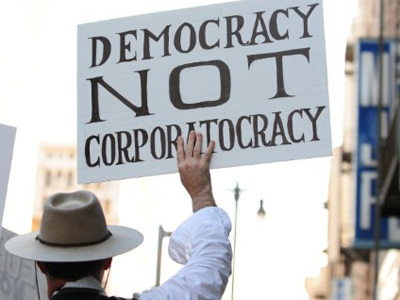 Demonstrations are multiplying in the US against the corporate greed that is blamed for leading the country to the brink of economic collapse. The US establishment lacks the flexibility to address the escalating protest properly, believes international affairs commentator Gregory Clark. 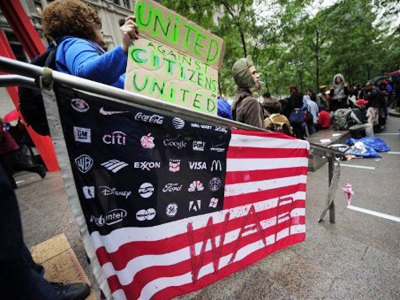 The demonstration in New York is gaining unprecedented momentum as thousands of people, including members of several major unions, have joined the Occupy Wall Street protests. The Transport Workers Union, one of the largest unions in New York City accounting for 36,000 employees, has joined the rally. Teachers are also on the streets together with the nation’s largest nurses’ movement. Students have walked out of universities in New York and throughout the country to join the demonstrations. 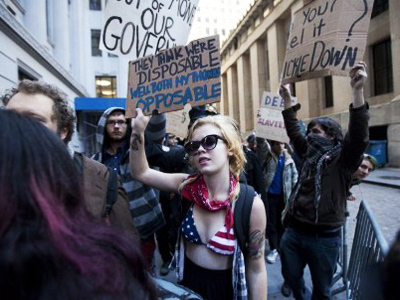 About 1,000 students have marched through lower Manhattan to join crowds who had camped out in Zuccotti Park. “This is Cairo! This is Tunisia! This is a movement taking place not only in the US, but one taking place all over the world! Enough with the Wall Street bailouts! We will win!” are some of the things that the demonstrators have been shouting, RT’s Marina Portnaya reported. 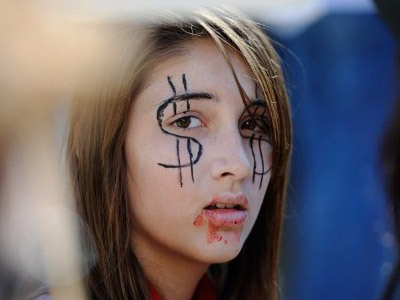 The anti-Wall Street protests – now in their third week – are continuing to spread across the country. Some of those marching have issued a statement claiming to represent 99 per cent of the population against the country's richest one per cent. There are two grievances that unite all of the protesters, Marina Portnaya says. The first is that they are frustrated with the disparity of wealth distribution in the US. The second is that they are frustrated with corporate influence over US politics. Frustrated Americans have been waiting for the economy to get better and have been waiting to reap some kind of benefits from the bailouts following 2008’s financial crisis. This movement has grown into a larger movement that is about the struggle of the working class Americans, who want accountability. They are armed with facts, they are not just going out in the street and screaming, Portnaya notes. The aggravation is increasing as annoyed Americans come together to demand that their elected officials change the system and make sure that things become a little fairer for ordinary Americans. Stephen Lendman, radio host, author and blogger told RT though the demonstrators have important issues they are trying to achieve, they will be accomplishing nothing except cosmetic changes. “They need committed leadership city by city. This is spreading all over the country now. I haven’t seen anything like this in 40 years. And this may have legs if they do it right,” he said. There have been some brutal responses on the streets in New York, but according to Lendman this will hardly stop the activists. On the contrary, it will only provoke more action. “This is what cops do – they beat up people. The people so far are very courageous, they keep it up. But I am afraid they will lose their interest as the weather gets colder,” he concluded.